How sleep deprived are you now and how will DST affect you? You wouldn’t think that an hour either way would make a difference to you, but it can cause disturbances in your body’s way of coping for days. Moving our clocks in either direction changes the principal time cue, light, for setting and resetting our 24-hour natural cycle, or circadian rhythm. In doing so, our internal clock becomes out of sync or mismatched with our current day-night cycle. How well we adapt to this depends on a number of things, but being sleep deprived already may be the biggest hurdle. In our society, sleep deprivation is a chronic problem for many. The demands of work, family and even exercise can create a schedule that’s beyond manageable. If we were able to prioritize our health and wellness above all, adequate sleep should certainly be at the top of the list. Our bodies are designed to shut down for a third of every day and when we don’t, there can be serious consequences. In the nutrition world, we know that sleep deprivation can increase levels of the appetite-stimulating hormone ghrelin and lower levels of the hunger-suppressing hormone leptin. In other words, when you don’t get enough sleep, your body tells you that you need fuel or energy in the form of food. This makes perfect sense because you’re tired, but given your hectic schedule, you’re likely to ignore the need for sleep and just eat! That’s a temporary fix that can lead to permanent weight gain. In fact, most adults need 8-9 hours of sleep. And sure, there are some folks that do well on 6 hours. But the truth is that adults who regularly get less than 7 hours a night are more likely to be obese. See where this is going? As DST starts, we are essentially moving an hour of daylight from the morning to the evening. This is a good thing! We may be coming out of hibernation mode where we tended to eat more sugar and starches and exercise indoors less than when we were able to be outdoors. Being outdoors more now and experiencing exposure to more sunlight can elevate our mood as well. Seasonal depression happens when decreased daylight throws off the body's biological clock, explains Kelly Rohan, a professor of psychological science at the University of Vermont who studies seasonal affective disorder (SAD). Levels of the hormone melatonin rise at night to help you fall asleep and drop in the morning to help you wake up. Now with more daylight hours during spring and summer, we can come out of our season-long funk and feel renewed. 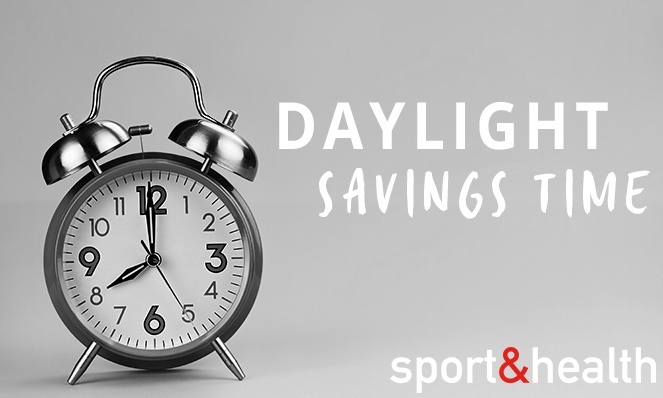 Since light is our principal environmental cue, be sure that you get plenty of daylight exposure in your waking hours, and eliminate any unnecessary lights in the evening. Wear an eye mask if needed and if you get up to go to the bathroom, have only a small night light on. Observe all the basics of good sleep hygiene, such as limiting artificial light exposure for at least an hour before bedtime. See my article about “Sleep Hacks” for more info on that. Short naps of about 20 minutes (not much longer!) can help prepare your body for a good night. Naps like these can help your body adjust to the time change and help you feel ready for sleep at your normal bedtime. For more information on health and wellness, please visit my website at www.judisamuels.com or email me at jsamuels@sportandhealth.com Thanks!